First of all we must know what heat map is? A Heat Map is a way of representing the density or intensity value of point data by assigning a colour gradient to a raster where the cell colour is based on clustering of points or an intensity value. In this article i.e to Create Heat map showing average household income. If you are not familiar with Leaflet then you may also look over Getting started with Leaflet js and all other leaflet js tutorial article page. Firstly we will initialise the container and add Open street map. As data is in JSON array format, to extract each value a for loop is applied. Here UsIncome is the data containing name, latitude, longitude and income value of each county of US. As average household income has used as intensity value. A function getMax() gets the maximum value of property from array. 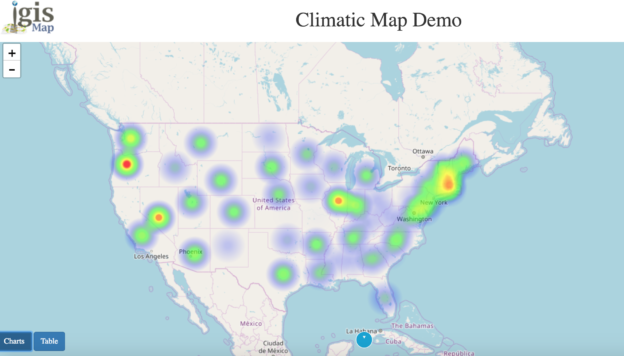 Now to use heatLayer or create heat map you need to add plugin either by downloading from https://github.com/pa7/heatmap.js/releases or adding script in your document. The map() method creates a new array with the results of calling a function for every array element addressPoints is an array of latitude and longitude. In the last markers are added with opacity 0.01 to make it invisible. BindTooltip has similar use as hover, shows popup when mouse is on marker. I hope this may help you in developing and creating a heat map in leaflet js. If you find any problem in creating one such example do let us know by commenting below.